Social Smoke Jasmine is a medium cut, slimy tobacco with a few small stems, none of which have been found disruptive to the packing process. Social Smoke Jasmine took about 10 minutes to deliver the richest of flavor and smoke. The aroma from the packaging was distinctly similar to that of jasmine tea. Sweet and mild. The smoke produced no head buzz at all. The session lasted about an hour and thirty minutes before the smoke and flavor began to die out. However, the session continued to be enjoyable for about another fifteen minutes. Jasmine’s flavor betrays the aroma a bit more than usual. Where the aroma is sweet and mild, the flavor is stronger and distinctly floral, with little additional sweetness—which is what one would expect form a ‘Jasmine’ flavored shisha tobacco. 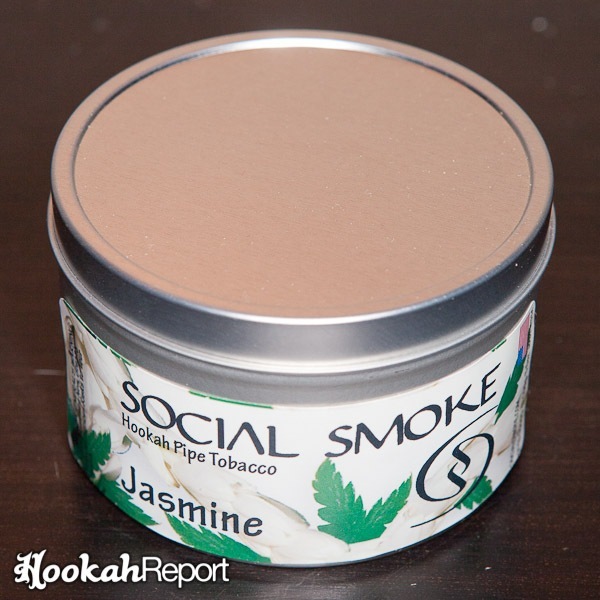 However, compared to jasmine flavors from other brands, such as Nakhla, Social Smoke’s version is a bit sweeter. As the aroma is very similar to a sweet jasmine tea, a bit more sweetness in the flavor itself would have been a welcome addition. The flavor is very tasty, but folks who aren’t totally sold out to the floral genre might find this too ‘bitter’, or like their smoking a bowl of potpourri. Big fans of floral flavors will most likely love this one. If you’re new to floral flavors, this may be a good place to start as it is a bit sweeter than many other similar flavors from other brands.